When Little Nightmares was first released in 2017, I’ll admit to paying it little to no attention. While horror is 100% my jam, this looked a little more cutesy upon first glance, so I brushed it aside in favor of Persona 5, which had released earlier the same month. In addition to giving another game my (extremely fleeting) attention, the Switch had just been released in the month preceding, and I will never pass up an opportunity to play with a shiny new toy. The Switch is actually what brings us here today, as Little Nightmares has just been released for the Nintendo system! Upon reflection, and hearing more and more about this new title, I decided to give it a shot, and boy am I glad I did. For anyone who has not yet picked this game up and is looking to bolster their Switch library, this game is high up on my suggestions list. Little Nightmares is definitely a horror game, and while it is rated Teen, I would argue it flirts with the mature rating. The darkness in this game is palpable. From the literal lack of light (thank you, tiny lighter) to the – suggested – atrocities that go on inside the Maw, this game gave me the heebie-jeebies from start to finish. The Maw is the ship we wake up on and Six, a tiny child, is our avatar. The goal is to get out, and after seeing various rooms and areas of the Maw, anyone would want to escape this place. There are a lot of extremely macabre images to be found in this game, and they hit you almost immediately. From blatantly morbid to suggestively gruesome, Little Nightmares really does paint a nightmarish landscape for our character. While trying to find her way out, Six suffers from crippling hunger, and whenever she is struck with these bouts of the grumbly-tummy you can’t advance until you find her food. This starts off easy enough; she is able to find food laying around or, in one instance, is thrown it by a mysterious shadowy stranger. But as you progress, even this simple aspect of the game becomes twisted and disgusting, forcing you to ask who the real monster is and if maybe Six isn’t what she appears to be. It’s hard to talk too much about the plot without giving anything away, but suffice to say, you’ll want to leave the Maw just as badly as Six does. The graphics really help bring the atmosphere to that next, super creepy level. There is a lot to see, and you’ll spot something new every time you visit a room. 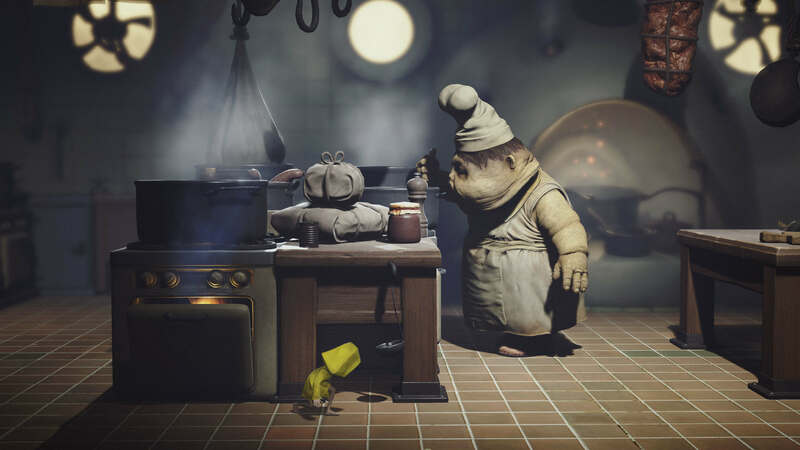 Little Nightmares always feels like there is something else just below the surface that we’re meant to see; you just have to look close enough and ask the right questions. The character design is amazing, from Six — who is made to look impossibly frail, as you can imagine any starving, lost child could be — to the disgusting monsters that work aboard the ship. Everything is oversized in relation to Six and this adds to the helplessness you start to feel as you move deeper into the game. Each task seems insurmountable, and every step could be just the wrong one to send Six to her death. I will admit to being frustrated with how dark the game is, lighting wise. It takes a little while longer than I’d like to scan a room because you have to go around with your lighter and check every nook and cranny, but after a while I got used to it and I will admit it adds just a bit to the scare-factor. You never know what’s hiding in a dark corner. The sound design of Little Nightmares is amazing. Every area has its own alarmingly eerie song. The entire soundtrack is perfect for a haunted house. I’ve played a few video games where the music just does not match up to the setting or takes away from it because it doesn’t mesh well enough. This is absolutely not the case with Little Nightmares. There is an overwhelmingly blood-curdling yet ethereal quality to it; every new piece causes its own unique goosebumps as it manages to bring forth images of both rusty nails piercing flesh and elegant dinner parties. Every note is meant to capture you and chill you to the bone. The discordant but melodic nature of the music is both jaring yet oddly comforting as it finishes the scenes the artists start. As you play through, pay special attention to the shifts in tone, or better yet, whenever you find yourself becoming more and more lost in the horror of your surroundings, note the musical addition to the ambiance, because it plays a heavy role in this game. While so far I have done nothing but wax poetic, I do actually have a couple of complaints about the gameplay. Little Nightmares can be incredibly frustrating to navigate at times. While much of the game is spent running from terrifying members of the Maw staff, there are plenty of obstacles that require precision and depth perception. The not-quite-3D nature of this game makes this incredibly difficult; the environment you transverse is 3D, but you have a 2D side-scroller camera angle. The perspective is off JUST enough to give you a headache when you drop to your death for the tenth time over a jump you could have sworn was well placed. I sometimes even had trouble simply picking things up, prompting many “For the love of God, you’re standing right in front of it!” exclamations. This can be an issue when trying to run from an enemy as well, as you often have to slide into a small hole between rooms to escape; I can’t tell you how many times I ran smack into the wall and was subsequently caught. Conversely, you could argue that this is a good thing, as it does add another level of difficulty to an otherwise fairly simple game. Without these challenges, you could just plow right through and have less time to take in your surroundings. For me, it was a nuisance, but a forgivable one. The length of Little Nightmares has been a sticking point for many. The base game without the DLC stories is around four to five hours, depending on how many times you misjudge those jumps. While this is fairly short in the world of gaming, the price point reflects this, coming in at twenty dollars. We aren’t expected to pay the usual sixty dollars for a day or two of gaming, unlike some other instances such as Kirby Star Allies, which, while fun, is only about five to six hours of story. I’ll gladly pay twenty dollars for a truly scary game that is well made and will leave a lasting impression. In addition, for those who have to get the DLC separately, each of the three installments is a reasonable four dollars. All in all, I would say this game is worth twenty/thirty-two dollars, but if you are someone who is specifically into longer stories, you have been warned. Little Nightmares is so much more than a survival horror game. The graphics and music work seamlessly to envelope you in a world of dread and disgust. Basic childhood fears are played upon, making you feel alone, helpless, and unwanted. The barbarity that this little girl witnesses as she tries to escape her dark fate is astounding and, honestly, shocking for a game rated T. The fact that you could feel so much trepidation playing a game that isn’t ever outright graphic speaks volumes of the work Bandi Namco put into this title. There are no jump-scares, but you will jump, and you will most definitely be scared. 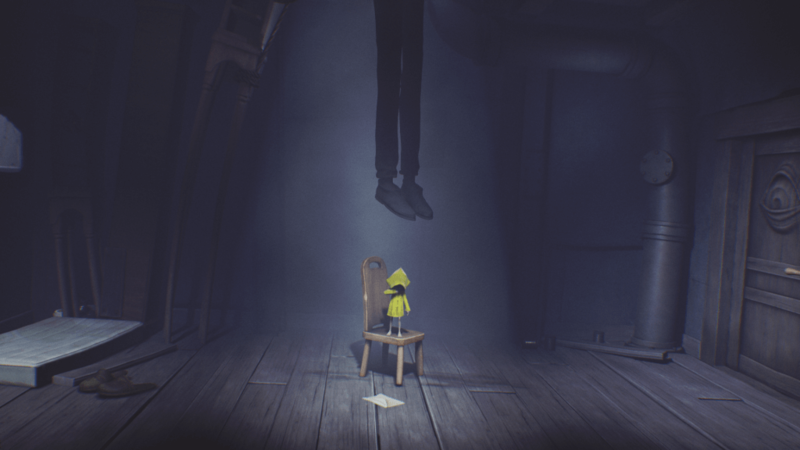 If you’re looking for a horror experience that will stay with you long after you’ve put down the controller, I highly recommend picking up Little Nightmares and beginning your escape from the Maw. 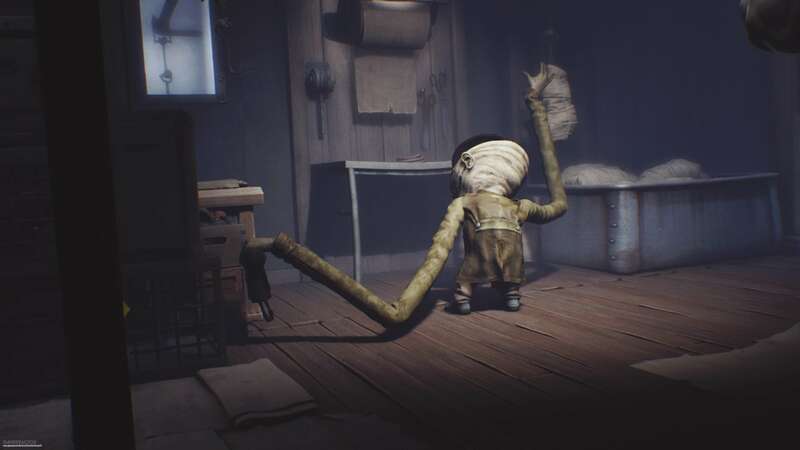 While the controls aren't optimal and the game-play can get frustrating, Little Nightmares is a wonderful addition to it's genre, and will leave even the most hardened horror fans with a serious case of the creeps.